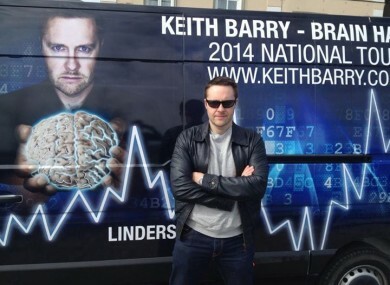 ‘BRAIN HACKER’ KEITH Barry has taken to social media to air his disgust after his appearance on Cork’s Red FM was cancelled at the last minute yesterday. Presenter Neil Prendeville pulled the interview when he learned that Barry had already appeared on rival staion Cork’s 96FM earlier yesterday morning. In a Facebook update Barry said that he had “never met such unprofessionalism” after Prendeville refused to have him on. Barry said that he had stayed up all night working on new demonstrations for both stations, and that Prendeville “was not even courteous enough to face me himself” when he showed up at Red FM’s studios. He also alluded to Prendeville’s “unfortunate incident”, and said that he had shown support to the presenter at the time in 2010. Had a blast on @Corks96FM this morning.was supposed to be on @CorksRedFM but they rudely cancelled as Neil acting like a premadonna! This morning Barry commented that he has been doing multiple daily interviews “for 6 years with no problem. Both had me confirmed as a guest, yes. I’ve done 3 nationals in the same day”. Prendeville has not made a comment on the incident, but Red FM has indicated that he will be addressing the matter during his show in Monday morning. Meanwhile, Barry has also shared an image on Twitter and Facebook of a tattoo of his likeness commissioned by a fan. He says he’s lost for words. As are we. Email “Keith Barry disgusted after Cork DJ Neil Prendeville pulls interview”. Feedback on “Keith Barry disgusted after Cork DJ Neil Prendeville pulls interview”.